The leading commercially produced cultivar in the world due to its natural resistance to adverse conditions and high yield potential. In taste tests in Australia, Azerbaijani was preferred in the high-yielding segment. Trials on Riverside Nursery are currently underway for more information on this relatively unknown variety. We believe that multipurpose cultivars should be planted, so that the first fruits in the season can be packed whole for either the export or domestic market. Thereafter the fruit can be used in aril extraction. 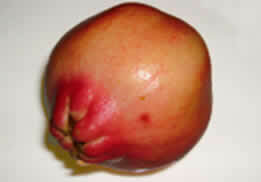 Fruit which has split or has some internal breakdown can go for juicing. All varieties will benefit from a rest period or dormancy, but the majority of cultivars do not require winter chill hours. Trees are more susceptible to frost damage prior to reaching full dormancy in autumn and at bud break in the spring. The bark is the most susceptible. Painting bark with white pvc paint will reduce the fluctuations between day and night temperatures. Trees are drought tolerant, but irrigation is necessary during tree establishment and critical for commercial fruit production. Sun exposure & air circulation are also important. 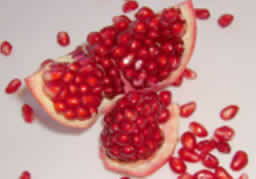 Pomegranates need at least 6hrs of direct sunlight a day to ensure good fruit colour & productivity. Orchard rows aligned North-South will maximize sun exposure. 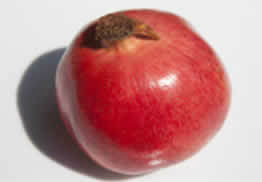 Pomegranates perform best on deep loamy soil, but do fairly well in sandy and light clay soils. 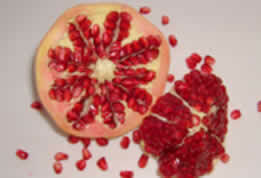 Pomegranates prefer well drained soils. Extended periods of excess moisture will harm the tree. Trees grow best in a pH range of 6.5. – 7.5. 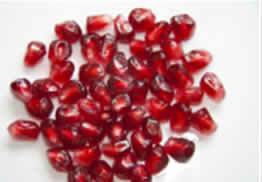 Pomegranates are moderately tolerant to salts and can withstand irrigation with water containing 2000 – 2500 ppm salt. Digging of plant holes: Dig holes a minimum of +-500mm x 500mm x 500mm (deep). If the soil hasn’t been ripped consider digging the holes double this size. It is advisable that an irrigation system is put in place before planting. Based on the results of a soil analysis one can add 200-400 grams of superphosphates to the planting hole, carefully mixed in with the topsoil. Never allow the roots of young trees to come in direct contact with the concentration of freshly applied phosphate fertiliser. No further fertiliser should be applied during the first 4-6 weeks after planting. As the trees are container-grown in soil less medium, it is best to shake the trees so that only 20% of the potting medium is left on the root ball so as to expose the peripheral roots to the soil. Such trees should commence growth soon after planting. Post planting; fill the basin with water as it will eliminate any air pockets in the planting hole. In areas where one can expect heavy frost conditions during planting time, it is advisable to wait until conditions improve before planting. Frost can cause extensive damage to trees, and in some areas it will be necessary to cover the planted trees, to protect them from severe frost conditions. Planting distances: We recommend distances like 4x3m (833 trees per hectare) or 5x3m (666 trees per hectare). Whilst some producers are planting 1000 trees per ha, 3×3 metres or 5x2m and even experimenting with planting of 1600 trees per ha. Although a very drought tolerant plant, ensuring adequate soil moisture will result in a faster growing pomegranate plant and increased fruit yield. Drip irrigation is preferred, with a dripper placed on each side of the tree. Overhead sprays will encourage the spread of field pathogens and will reduce fruit set as flowers are very sensitive to humidity and moisture. Fruit will mature from February to April. Commercial harvesting normally starts in the 4rd year, approx. 10 -12 kg fruit per tree, increasing to 15 – 18 kg in year 5; and 18-25 kg in year 6, reaching towards 40-60 kg at maturity (cultivar dependant). 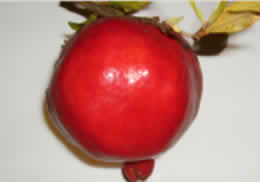 The pomegranate has similar storage properties to the apple in having a long storage life. It is best maintained at a temperature of 0º-5ºC and may be kept for a period of 3-5 months within this temperature range and at 80 to 85% relative humidity, without shrinking or spoiling.